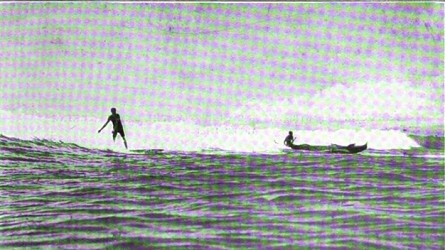 george marvin : the surf at waikiki, 1914. 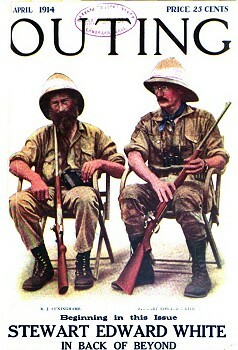 Volume 64 Number1 April 1914. 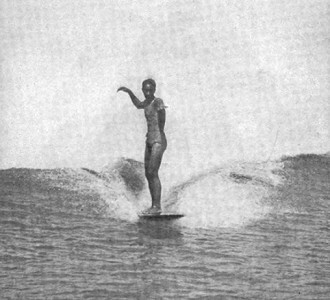 An extensive account, the technical elements of surfboard riding are incorporated in a semi-fictitious story featuring native Hawaiians Duke Paoa (Kahanamoku), Kahola, and Makaele, and haoles Judy, Mrs. Neave and Marvin himself. Dela Vega, et al. 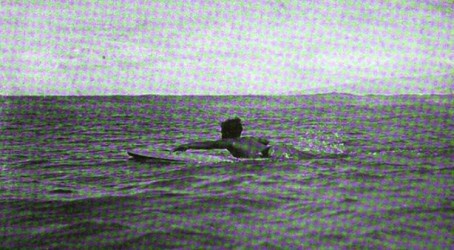 : 200 Years of Surfing Literature (2004, page 53) notes the photographs are by A.R. Gurrey Jr. Some of these had been previously pubished, unusually there are two photographs of paddling (page 27) and waiting (page 31). Selected and arranged by Eva March Tappan, Houghton Mifflin, Boston,1916. 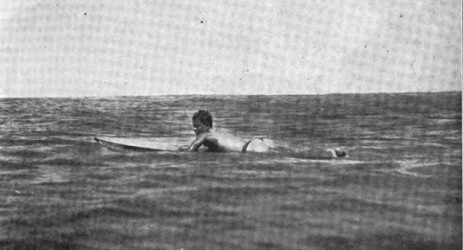 1916 George Marvin : Riding the Surf at Waikiki. EVERY country has its own customs in sport as in other things. 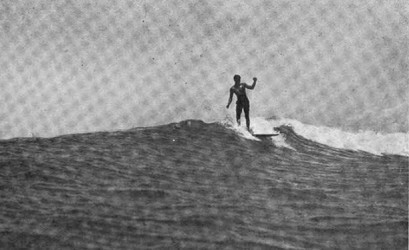 It has remained for Hawaii to reign preeminent in the manly sport of surf-riding. 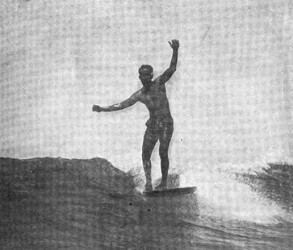 The conformation of the beach and the bottom along the island shores brings the waves in in long, carrying swells that shoot the expert rider toward shore with the speed of an express train. None but a strong swimmer dare venture out, but for those who can do the trick there is nothing can beat the sensation. The article which follows is a narrative of a typical experience at Waikiki, where the conditions are perhaps the best in all the islands, as recounted by a newcomer. PAST us as we sit on the sand waiting for Linda runs Duke Paoa, stripped to a blue breech clout, with his light "alaia" like a dark mahogany ironing-board under his arm. "Hai," in his sing-song voice, "wait for us; what's your hurry?" 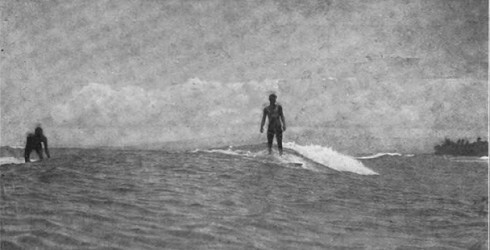 "Goin' out with Kahola," the Duke calls back without stopping, heading off down the beach where Kahola's mighty back makes a warm-colored break on the white sand. 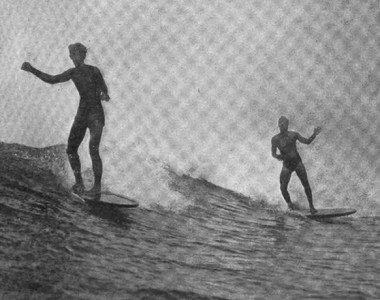 "The two best surfers in the islands," says Makaele, watching them. "See, they're goin' to ride the big surf this mornin'." gether, moving still farther away to the left, slosh out through the shallows. Pretty soon, waist deep, they slap their boards down and begin paddling through the broken white water where spent rollers come creaming up the sand. "Yes, surely the two best here at Waikiki—not counting yourself, Mak. Kahola slower, not so graceful. But how about the other islands, Niihau or Hawaii? Those wild stories of Hilo Bay?" "Everyone says the best in the world are here," says Makaele, throwing handfuls of sand on his coppery legs. "But those are not wild stories. After a big kona (south wind) at Hilo I have seen men come in standin' three miles across the bay, fair tearin' up the ocean. At Niihau, the reef is very far out there, farther than at Hilo, five miles even they ride in that surf, though I have not myself seen them. Your 'alaia' is not seven feet. Paoa's and mine less than six. Now at Hilo Bay they are often ten or twelve, sometimes more. To manage an olo like that takes a very strong man, like the old chiefs." "Like old chief Kahola there navigating that barge of his. Anybody else would have to lug it out in a canoe." The two champions, outward bound, are hurdling their first breakers. Three or four other "kamaainas" (old-timers) are riding in on the "big surf," their poised, glistening bodies coming zipping ashore, picked out against the dark tree line over toward Diamond Head. skinned kanaka boys are playing, and westward, near the Outrigger Club, a couple of canoes are launching in what they call the "cornucopia surf," where the neophytes, the "malihini," learn their first lessons in riding the rollers. The difference in these three parts of Waikiki beach lies simply in the way the coral and sand shoal out to the reef, a mile or so offshore. From where we sit the whole sunny sweep of sparkling ocean seems the same, as from one wooded point to the other the long, onward-marching ridges reach clear across in even succession. But when you get into the water there is a whole lot of difference between the big surf, where eastward a more abrupt shoal piles incoming waves up steep and strong, and the serener cornucopia rollers where the bottom goes out almost flat for half a mile or so. One of those outrigger canoes up there belongs to Linda, the dilatory, who is keeping us waiting. She's got that pretty Mrs. Neave with her, who came in yesterday on the Tenyo Maru from 'Frisco, "just crazy to try surf-board riding," as she calls it. So Linda is taking her in an outrigger to-day to see it done and give her a long coast back in the canoe. Makaele and I are part of the Roman holiday, a very willing pair of barbarians. We don't mind waiting much either, for it is very comfortable lying here in the sun-warmed sand. Makaele has got started on his folklore about the extraordinary stunts of the old Hawaiian chiefs, who "used to run seven and eight feet tall, sure kela." Some chiefs, those, as the pretty Mrs. Neave would say—and their Homeric surfing on twenty-five foot boards that no modern man could lift. ARMS GOING LIKE PADDLE-WHEELS EACH SIDE. Punctuating Makaele's monologue come the shouts of the laughing kanaka boys, beginning now to paddle out together toward the reef, and from time to time I can hear the drone of the Honolulu trolley car with its changing note as it hits the bridge back of ex-Queen Liliuokalani's house. The blue sky comes down clean and sharp, to the darker blue of the deep Pacific beyond the reef where the white sails of fishing boats are heaving. "There they are," says Makaele, suddenly breaking off in the maritime amours of Kalea and Kalamakua, and summoned out of our sun-baked laziness by Linda's familiar whistle, we are off down the beach to meet two graceful figures drifting in long white bath wraps to the sea. Behind them Linda's French maid comes mincing like a cat, trying to keep the sand out of her tight patent leathers. The kanakas in the outrigger have sighted them, too, and are coasting along toward us, both paddles going. "You wouldn't believe what a time I've had to make her leave her skirt off," laughs Linda. "That's what has kept us all this time. her long-lashed eyes to us, "there's a perfectly good chance of our upsetting out on the reef or turning turtle coming in, and then where would you be, Mrs. Propriety, with an old skirt wrapped round your legs?" Mrs. Propriety hugs her bath wrap round her. She is the color of shell-pink coral, with a wisp of gold between that and the deeper shade of her bewitching bathing cap. "But, Linda, darling, at Narragansett I have swum—swum, swam, swimmed, which do you say?—as far as that several times, and always in my bathing suit. These Annette Kellermans of yours are worse than the front row in the chorus— I feel like an aborigine—there"
And so saying she gives the bath wrap a whisk and a kick to Celestine and makes a dash for the canoe. Linda takes her white mantle off slowly and hands it to the maid. She makes a fine contrast to the lady from San Francisco, her arms, shoulders, neck and face almost as brown as Makaele's, her uncovered mass of black hair coiffed tightly, her figure as straight and strong as Kalea's must have been. The two girls splash laughing up to the outrigger, Linda helps the coral-pink in amidships, then she and the two kanakas start paddling easily out in the soapy water. Makaele and I are right after them, running with our boards like sleds in both hands as far as we can keep our knees free, then, souse! flat out we shoot alongside them. watching Makaele, forgets all about her bathing suit. This is one of his specialties. 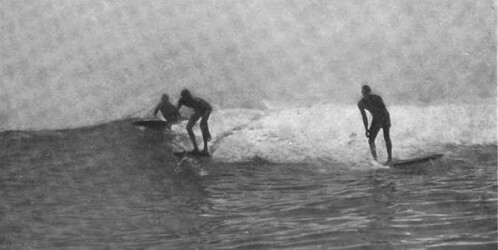 front end of his alaia scowing over the water like the bow of a launch. Everyone goes out more or less that way; I'm doing the same thing, but only two or three others can make such speed as Makaele, even when he isn't showing off. "Keep way over to your left," calls Linda; "we must see the Duke and Kahola coming in." So our squadron changes its course and, swimming and paddling diagonally in the long intervals between waves, we work over eastward toward the edge of the big surf and always outward toward the reef. This matter of navigating out with your board is an important part of surfing and good fun, too. At first you think you are going to wear your short ribs right through the skin from the chafing of your position on the hard "koa" wood, and for the first week of your malihini-ship you contract pains like inflammatory rheumatism in your shoulders, the back of your neck, and the small of your back. But the sun and the exercise bake and work the soreness out of your muscles long before you make sufficient progress in the science to take the soreness out of your spirit. This is the leeward side of the island, you see, so there is never a pounding surf inside the reef, even after a storm. Also, over this flat, level bottom the surf forms slowly and is slow to break. the surf will come in series, three or four, or even seven, crests at a time, rolling very grandly in a sea procession. Soon we strike our first big waves. Over the first two broken ones Mak and I coast. Then I see him dive headlong into the third, which is curling to break, and in a minute I follow suit, depressing the front of my board with a sharp forward thrust. On the reverse slope, looking back, we see the outrigger lift drunkenly over the white ridge and come down, ke-slosh! ke-zop!—Linda a victorious figurehead in the bow. In negotiating these big toppling fellows you must be careful to duck the front of your board just right as you dive through, otherwise she is apt to plumb the depths without you or set you back shoreward with a big drink of saltwater. Now comes a level space and way ahead of us we make out the dark heads and shoulders of the Kanaka boys sitting on their boards waiting for a good wave. There it comes, its mounting top shutting out the sails of the fishing boats. We hear them calling to each other excitedly "nalu-nui!" (big wave) and "hoe, hoe, hoe" (paddle, paddle); then with a shout the row of dusky figures out at sea leap upright on their boards and come tearing in. Theirs proves to be a lumpy wave, badly chosen. We slip over it as they go cheering by to the west of us, but on behind come some hummers, and right on the crest of the second stand two figures glorified. "Look, look," calls Makaele back to the canoe, "the Duke and Kahola!" They must have seen us coming out and swum across, and a good thing they did, too, for now the eager visitor will see the finest sight at Waikiki, the last word in surf riding. No race in the world is so beautifully developed as the Polynesian, and these two men are the pick of their race. Without changing a line you could put them into a Greek frieze, but you would have to animate or electrify the frieze to keep it in key with their poised grace supreme in this immemorial pastime of their people. Both are as much at home on the streaming mane of a breaker as a Pawnee brave on the bare back of a galloping bronco. Ducking through the top of the wave ahead of theirs, we emerge to find their glistening brown bodies against the sky surging down a smoky green hillside. A familiar sight, it is nevertheless a miracle, for the boards are nearly hidden in spray so that we behold shooting down at us two youthful Tritons not, as they really are, obeying the course of the wave they ride, but directing it; ruling, triumphing over, the ocean. "Ai-i-i-i-e-e-e-e!" yells the Duke, ashe goes streaming by, light as the spray smoking after him, the last of his yell swallowed by the half-drowned work I make of that breaker because of watching him too long. It is still a good long hoe out to the reef and Mak and I, already half a mile offshore, decide to mark time hereabouts, the outrigger going on to the "kulana nalu," place where the surf begins to form, so as to give our now highly enthusiastic gallery a longer ride in. Off they go seaward, disappearing and reappearing, and one of the kanaka boys we lately passed, who has lost his wave and with it his companions, paddles up to join us. He and I, sitting on our boards, shove them all but the tip under water. Makaele, a brown merman stretched out half submerged on his light shingle, kicks his feet lazily. In this seventy-eight degree water we are even more comfortable than on the sand ashore, and the view is finer. Off to the eastward old Diamond Head, couchant like ourselves, stretches out into blue water, the iron pyrites at itsbase shimmering like myriads of real diamonds. Millions more of sparkling water diamonds the sun makes far west-ward over the sea to the purple headland of Waianae. Straight ashore, in interrupted views, stretches a long, white band of beach with the parallel green band of palm and rubber trees above it broken by square hotels and angular, ugly houses. us up, we make out a fine series of surf charging toward us hot off the reef, the canoe chasing down the face of the first hill. Now it is all action with us, for to catch a wave just right you must get going at top speed before it overtakes you. "Hoe, hoe, hoe," yells the kanaka boy, but "No!" Mak sings out; "wait, wait, no good." Checking my headway I see he is right, for this first wave is a dull, heavy-moving one with a lumpy surface. In spite of its threatening height it will peter out,before it gets ashore and be absorbed by the following surf. You must let that kind, or double ones, go and wait patiently for a precipice with a jagged edge toppling over you. The canoe goes sifting by down the steep slope we climb, a burly, naked mariner high in the air astern straining over on his paddle to keep her head straight, a cloud of fine white spray whisping up from her forefoot. a Gabriel-horn kind of noise, the result of Linda's contralto jeer at us mingling with her friend's high soprano shriek of delight. We let them go with their inferior wave, and the next one, too, but the third, a high green comber with a dancing ridge of spray, we mark for our very own. There is a lot of excited yelling in the process of making this judgment unanimous, but then each man is down on the tail of his board with never another look behind, legs churning madly and arms whaling the water for dear life. Now the surf has caught us, towers over us. I feel my feet lifted in the air, the board shoots forward, higher and faster I drive till in a sudden white seething I break through the top of the wave. Then, lost for a second in the foam, quick my hands slip back, legs gather up, one foot in front as though kneeling, and I rise head and back together, feel for the balance center, then stand erect. 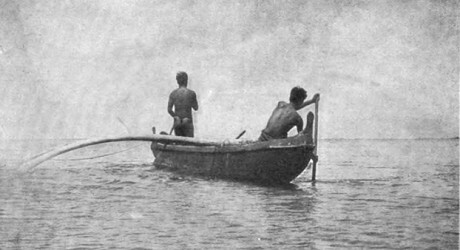 Just ahead on my right Makaele is calmly standing in a smother like the wake of a motor boat; behind on the other side the kanaka boy is whooping, and we are off all together, forty miles an hour, for the coast. Anyone who has sailed a racing canoe in a fresh breeze, or held the tiller of a sloop running free in a heavy following sea, will have some idea of the sensation of surfing. Only you must multiply those other sensations by at least ten to get the exhilaration of riding a big surf at Waikiki. The lift and yawing thrust of the wave under you is something like that you feel in a boat, but a twenty-pound board is, of course, far more sensitive. When you first stand erect, it feels as though you had suddenly spurred some gigantic marine monster with the wild response of a thoroughbred hunter rising at a fence, or as though the Ancient Mariner's Spirit of the Deep had reached fathoms up a great hand to hurl you like a javelin at the beach. As a racing canoe is balanced on a rigger out to windward, so we, standing upright on our racing boards, balance them by anticipating the whim of the wave, keeping them coasting forever down hill and never reaching the valley. While the surf is high and steep I stand back on the board; when it begins to flatten out I slip forward. her climb too high or I shall lose the wave and be dragged backwards over the crest as though someone had suddenly tied a flock of peach baskets on behind. And all the time, like a shying colt, she is apt to slew sidewise; sometimes I let her slide off on the bias and then straighten her with a flip of my legs, when she shoots ahead again, obeying the tread of her master's feet. A great wash of air and water; tingling life and speed, speed! We are chiefs of old back in the springtime of the world, in the undiscovered Pacific! And so at length we drive into the "kipapa," the place where the long rollers from end to end break and cornsfoaming down in white ruins. Here is the canoe close at hand. 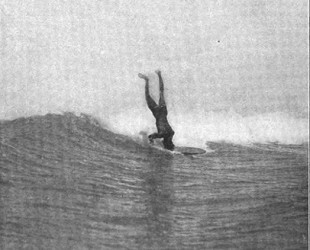 sheer exuberance, stands on his head on his board and goes on so, his legs in the air like the spars of a derelict. I tread back from the "muku" to the "lala" side of the wave, am caught in the drag, and stop as though I had run into a rope. My board sinks slowly and I swim with it alongside the canoe. "if I have to stay here a year." makes a beautiful porpoise dive over the side. 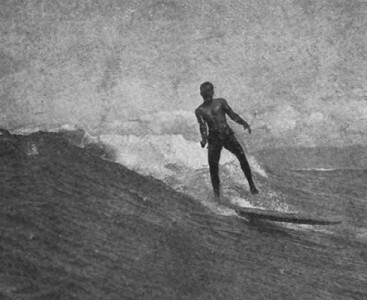 Geoff Cater (2017) : George Marvin : The Surf at Waikiki, 1914.